It's a "dark day for internet freedom." The law is divisive. Especially Article 13: opponents call it a “meme ban,” and say it’ll limit freedom of speech by forcing “upload filters” on any user-uploaded content and give big tech an even stronger grip online. Advocates, on the other hand, say that it will force big tech to pay their fair share. 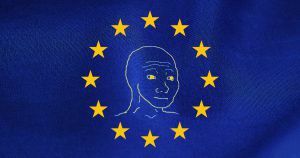 What’s certain: the internet in Europe will never be the same. One controversial part of the Directive, which many observers have dubbed a “meme ban,” would force major platforms like YouTube to filter every single upload to prevent copyright infringement. Supporters of the Directive say that “meme ban” is inaccurate, since memes would fall under the label of “parodies” and thereby be protected, but opponents argue that automatic upload filters won’t know any better. Another stipulation, which opponents have dubbed the “link tax,” would force news aggregators — including heavyweights like Google News — to remunerate publishers for linking to their articles.